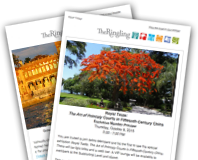 All employment opportunities at The Ringling are posted at the Florida State University Human Resources website. New openings are posted as they become available. Internships at The Ringling provide unique insight into museum careers through practical work experience. Fellowships prepare you for a career in museum management and administration, museum education and curatorship. Volunteers perform a variety of functions. Tram drivers, theater ushers, store assistants, gardeners and more. View the opportunities now available.